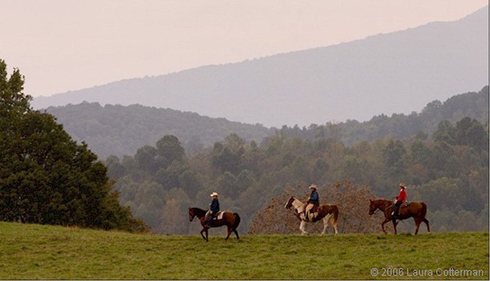 Enjoy trail rides, cattle drives, and horseback riding vacations at the Western style Marriott Ranch in the foothills of the Blue Ridge Mountains in Virginia Hunt Country. Marriott Ranch isn’t your typical Marriott. 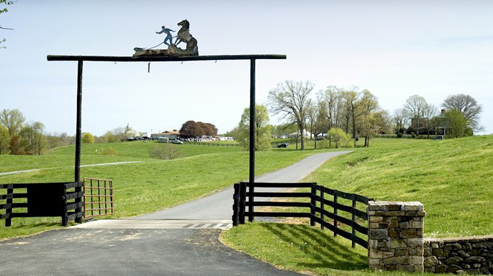 This working cattle ranch is teeming with American history and scenic natural beauty. 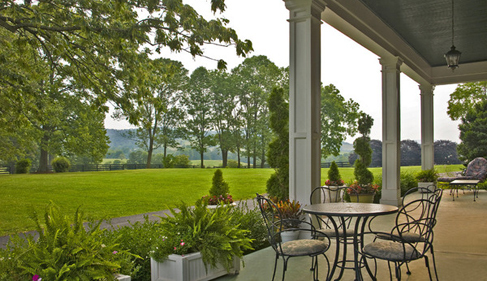 It lies just east of the Appalachian foothills amid the vineyards of Virginia Wine Country. The Rappahannock River runs through the property and its rolling green hills and meadows are dotted with exotic Longhorn cattle and horses. The ranch was purchased by J.W. Marriott Sr., as a private retreat in 1951. Prominent guests like Presidents Reagan and Eisenhower and other world leaders have spent time on the range at J.W. Marriot’s retreat. There’s a lot of beautiful open space, streams, meadows and wooded trails on the seven square mile, 4,200-acre working cattle ranch. Marriott Ranch also boasts Longhorn Cattle. Children must be at least ten years of age to ride and 16 years old or older for the Special Themed Rides. Maximum weight limit is 250 pounds. Please contact Kelley Moss at Marriott Ranch to arrange special rides or group departures. For individual reservations call 540-364-3741, 540-364-2627 or toll-free 877-278-4574. Enjoy a one hour sunset ride and cowboy dinner with guitar entertainment. For the experienced rider. These are 2 1/2 hour rides. All rides begin at 10:00am. For the experienced rider. Ride starts at 10:00am and returns at 3:00pm and includes a stop for lunch. Experience a day in the life of a cowpoke as you learn horsemanship skills and cattle handling techniques. October 30th & 31st (Thurs. & Fri.) Arrival time is 1:00pm. Cost: $385.00+ tax per person. Arrangements can be made for groups of 12 to 15 people also. Private group dates also available. $385.00+tax per couple Includes overnight accommodations with a hearty country breakfast, a ninety minute guided trail ride for two, a gourmet picnic basket and three wine tastings at neighboring wineries. Subject to availability. Private Rides (walk, trot, cantor) $90.00 per person These rides are available Tuesday through Friday (no weekends), 90 minute ride – by appointment only. Please contact Marriott Ranch to arrange special rides or group departures. Scouting, Youth Group and Group Discounts are available. For individual reservations call 540-364-3741, 540-364-2627 or toll-free 877-278-4574. 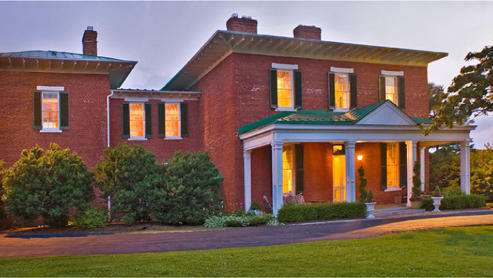 Located at the center of the 4,200 acre Marriott Ranch is the historic James Marshall Manor House (circa 1814), which is the focal point of the Inn at Fairfield Farm. The seven comfortable guest rooms located in two unique buildings along with scenic views help our guests relax and enjoy what the Marriott Ranch has to offer. Guests staying at the Inn at Fairfield Farm are welcomed with a complimentary tray of cheeses (4 PM - 6 PM) along with an assortment of refreshing beverages. In the morning, a memorable 3 course "Fairfield Farm" country breakfast is served, generally between 8 and 10 in the morning. There are also area restaurants and pubs to enjoy. 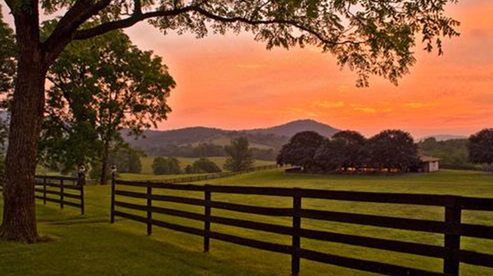 This vacation is in Virginia Wine Country. There are numerous pubs, restaurants and vineyards within driving distance of the ranch. Included in the Western Vacation Package is unlimited bar service. Marriott Ranch has countless opportunities for outdoor recreation. 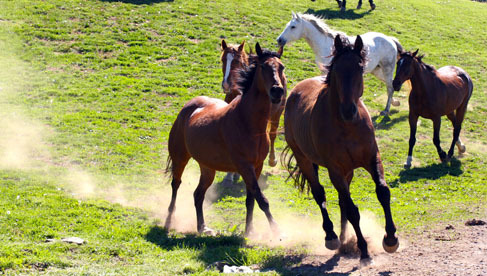 Activities range from horseback riding to deer hunting. Inn guests can feel free to hike throughout the property in search of the perfect spot for a picnic lunch. In the winter, be sure to bring your sleds, as the grounds provide ample hills for sledding. Wildlife abounds at the Ranch and guests should keep a lookout for white tail deer, red fox, black bear and the ranch’s own family of Bald Eagles. On a clear day guests can even see Skyline Drive, which is a short drive away and provides access to the Appalachian Trail. 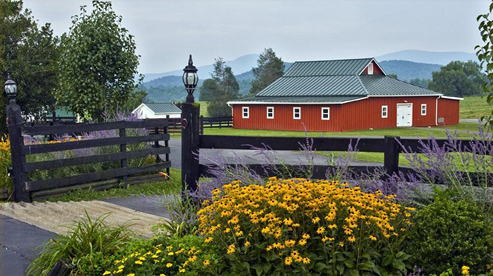 The charming horsey village of Middleburg is only an hour’s drive. There are equestrian realted shops, historic restaurants and the National Sporting Library in Middleburg. 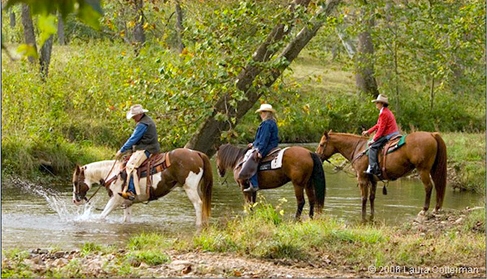 Virginia horseback riding vacations, trail rides, cattle drives and Western Vacation Packages at Marriott Ranch. Hume, Virginia. 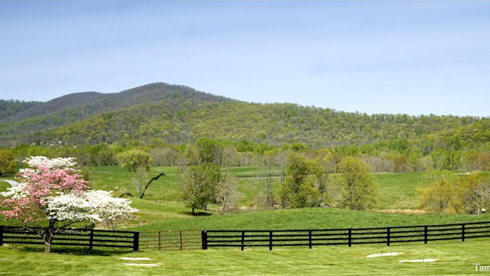 The foothills of the Blue Ridge Mountains in Virginia Hunt Country, just 50 miles from Washington, DC. Marriott Ranch is open year-round with the spring and fall having the best weather. 90 minute trail rides are $40 to $45. 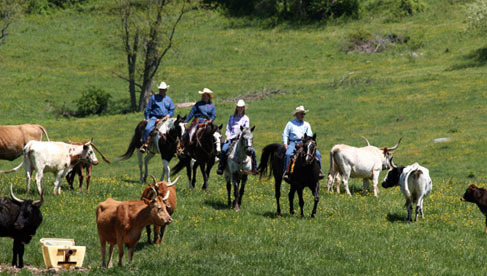 2013 Ranch Western Vacation Packages - $680.00 per person double occupancy + tax; $875.00 per person single occupancy + tax. Enjoy a day of driving our Texas Longhorn cattle and a stop for a barbecue-style lunch. 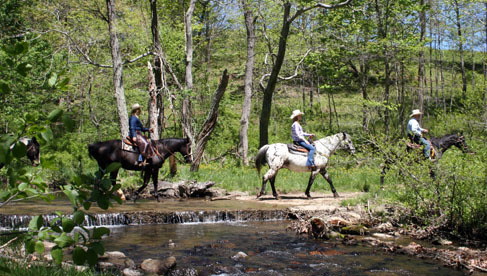 Visit MarriottRanch.com for complete options and rates for trail rides and horse riding vacations. Travel Agents Accepted- Marriott Ranch works with travel agents!